George Osborne, the shadow chancellor, said that the Conservatives planned to get rid of the Financial Services Authority if they were to win the next general election. Under their plan, the FSA would be renamed to the Consumer Protection Agency and would be responsible for consumer issues while the Bank of England would have overall power and would also be responsible for monitoring and regulating the banking sector. This move would abolish the tripartitie system consisting of the FSA, the Bank of England and the Treasury which was set up in 1997 by the then chancellor and now Prime Minister, Gordon Brown. Leaving the pros and cons of such a policy on one side, I don’t think it’s right to announce definite plans of what would happen to the FSA if the Tories were to win power. That is because it diminishes FSA’s authority now when it is trying to regulate the banking sector as nobody will then take them seriously because everybody knows that the FSA’s days are numbered. Think of a CEO that announces that he is to step down after a year and names his successor. Who do you think will hold the real power now, the CEO or the person who will succeed him? A leader with a sword over his head doesn’t have any significant power as everybody in the organisation will listen to the new guy who will eventually be in power. Rather than really bring about a change in the banking regulation, it seems that by announcing their plans, the Tories are trying to earn some political brownie points by taking advantage of Gordon Brown’s unpopularity. Even though it may be obvious from the numerous polls and the general sentiment amongst the public that the Conservatives are going to win the next election, it does not mean that they have won the election and are in power. The mainstream media are increasingly interpreting the phrase “if the Tories win the next general election” as “when the Tories win the election”. The thing is, whether we like it or not, Gordon Brown is still the Prime Minister and the problems plaguing the financial sector have to be dealt with now, by those who are in power now. By announcing that the FSA is doomed and the media hanging on to George Osborne’s every word, it affects the authority that the people in power have when they try to be though with those running the financial institutions. So when you read the headline “FSA warns banks over long-term bonuses” in the Financial Times, you don’t picture a strict headteacher warning a student, but instead picture a lion without any claws or teeth in a zoo letting out an inaudible whimper rather than a ferocious roar. If the regulators and policy makers have no authority, how is the change to be brought about. It’s no wonder then that some of the financial institutions, which not less than a year back, were on the brink of collapse and some even went to the government cap-in-hand asking for financial help are now announcing record profits and are still trying to pay bonuses even when the so called “bonus culture” has been criticized by the regulators, the prime minister and the chancellor for hastening the speed of the financial mess. Sure, its necessary for the public to know the policies of each party to enable them to make an informed decision about whom they will cast their vote. But for a political party that is desperately trying to distance itself from the negative publicity from the MPs expenses scandal and hoping to win the next general election, it doesn’t seem right when it tries to capitalise from its opponent’s unpopularity and kicking him while he is down. First the Chancellor giveth, then the Chancellor taketh away. 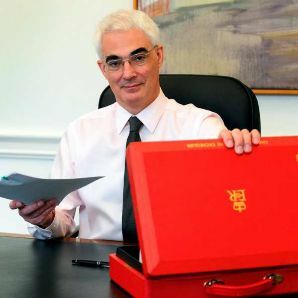 Yesterday, the Chancellor Alistair Darling announced in his Pre-Budget Report the much talked about 2.5% cut in the VAT, bringing it down to 15% from 17.5%. In the same breath, he also announced an increase in income tax for those earning £140,000 and above. From April 2011, people falling into this income bracket will have to pay income tax at the rate of 45p. The cut in VAT is to come into effect from the 1st of December. This leaves ample time for businesses to revise their prices and change the all the labels in the stores, but at the same time, being just in time before the Christmas shopping. So, how will the change affect the prices? Will a loaf of bread or a bunch of carrots be any cheaper? No, because food products do not attract VAT. Surely, utility bills as a result will go down. Sadly, no because the VAT on utilities such as gas and electricity already have a lower rate of VAT charged at 5%. A cut of 2.5% doesn’t look as if it will make a huge difference in prices, especially compared to the generous 20%, 35%, 40% discounts offered by the retailers already. Then, the motive behind the cut is to give confidence to the consumers to go out and spend. But, confidence cannot be used to pay for a brand new PlayStation 3, can it? You need something else, namely, money. The primary reason why people are spending less money on the high street is because they have very little surplus left over after paying the high utility and food bills. And those who have enough surplus choose to save it for a rainy day. That’s because it’s almost impossible to see a news report nowadays without it mentioning yet another company announcing job cuts. This creates uncertainty among those who are employed about the security of their jobs. Those who have recently been made redundant have no choice but to save money. But those who have a job also save since they don’t know how they are going to put food on the table next month or meet their mortgage repayments. Another thing that’s hard to miss in a news report is an interview with the boss of a SME (Small & Medium Enterprise) business who has been denied a loan from his bank, or has had his overdraft facility cancelled. This leads to cash flow problems which means the business cant pay its staff, pay its utility bills, or even buy raw materials to maintain production. In addition, creditors, who owe money to the business, are unable or reluctant to part with their money. As a result, staff numbers have to be cut down adding to the number of unemployed across the country. How can such news create confidence? Perhaps, the Chancellor should look at reducing the VAT temporarily on utilities, or even get rid of them for the time being. More importantly perhaps, he should make sure that SMEs, who are perfectly healthy, should have access to loans and overdrafts at a reasonable cost to maintain their cash flow. After all, the SMEs are not asking for charity, just for funds which they are prepared to pay back with due interest. It makes sense for the Government to ensure that businesses that are perfectly sound to not go bankrupt just because they do not have enough cash or credit to meet their current liabilities. After all, the SMEs employ a lot of people in the private sector of the economy and contribute to the Treasury in the form of National Insurance and Corporation Tax. Since people are employed, it saves the Government the trouble of have to pay job seekers allowance, hence reducing its outflow. So, it is perhaps job security and income security that will encourage the consumers to go out and spend, as Alistair Darling and Gordon Brown along with countless retailers are eagerly hoping, fingers crossed. But it seems highly unlikely that the cut in VAT will have the intended purpose of instilling confidence among the consumers and going on a spending spree, but for the sake of the economy and the countless people who are unemployed, lets hope its not all in vain. The high earners are certainly hoping for it, since they are going to be paying for it, come 2011.